I am a cancer free, survivor patient treated with IPT/IPTLD. 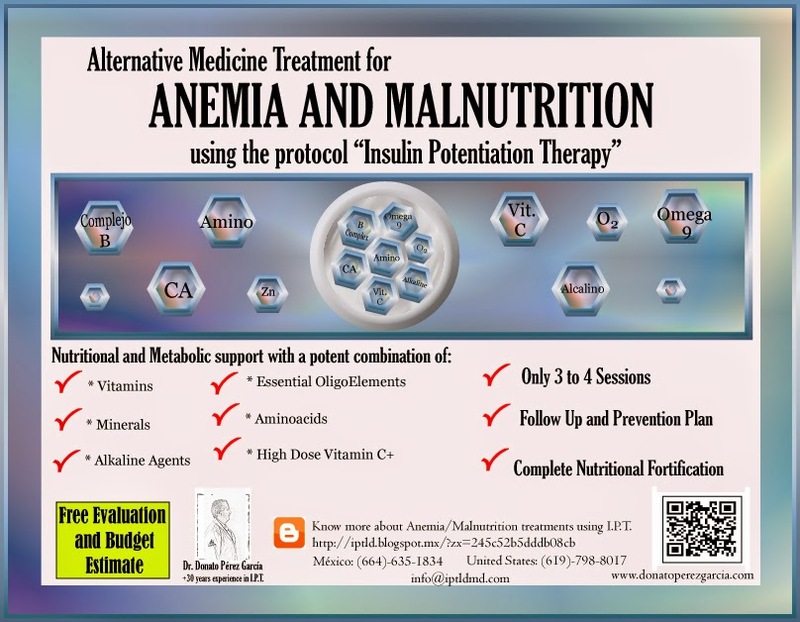 Testimonials: ANEMIA AND MALNUTRITION TREATMENTS WITH I.P.T. In its origins, I.P.T. was used by Dr. Donato Pérez García I (1896-1971) to treat his poor health condition. He had lost a lot of weight and appetite. He began using I.P.T. on himself, noticing that food nutrients where better absorbed with this protocol. He’d suffer for anemia and malnutrition for many years, and in a matter of weeks he regained strength and weight. He applied I.P.T. every week for the rest of his life. The efficiency of I.P.T. for cases of anemia and malnutrition, continues to be a success. Using this delivery system, I.P.T., in combination with potent I.V. nutrients, ensures maximum absortion and fortification with Vitamins, Minerals, Aminoacids, High Dose Vitamin C+, B Complex, Alkaline Agents and Oligoelemts that the body needs to restore itself. Patients will feel a difference within de 2-3 treatment, restoration of appetite, increase in energy and immune support. All our medication and I.V. Nutrients are from natural origin, no chemicals to damage your body’s natural balance, and all the high quality stamp of +30 years experience from the leading doctor in I.P.T., Donato Pérez García, M.D.